Global Observation Research Initiative in Alpine Environments and is a worldwide protocol to study climate change on mountain tops. It was developed in Austria and came to the U.S. in 2004. 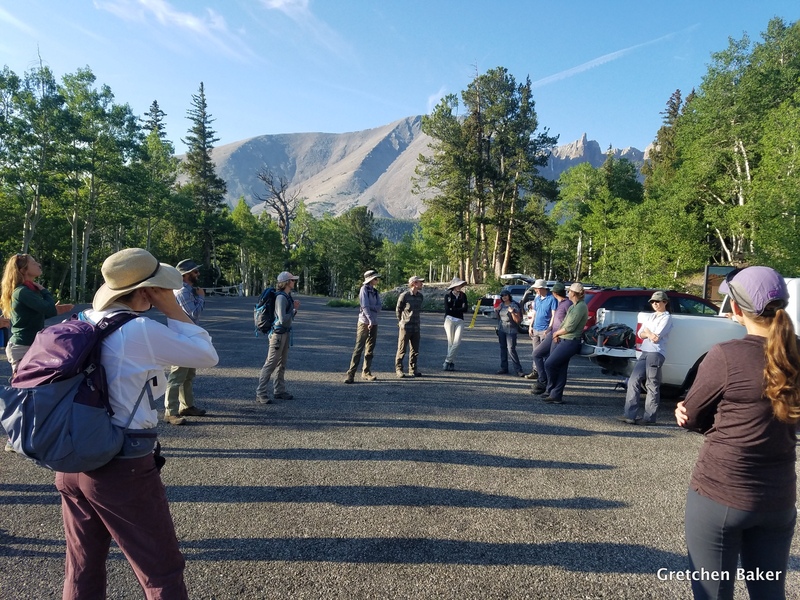 Great Basin National Park became part of the GLORIA network in 2008. 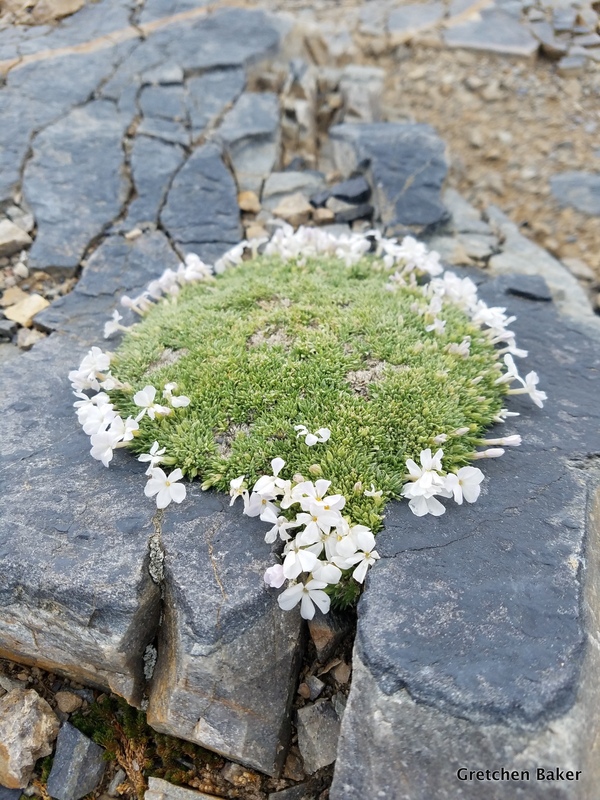 The basic idea is that as climate warms, plants will move uphill to seek cooler places to grow. So if we study what lives on mountaintops, we'll see what's moving up to the highest elevations. Or in some cases, maybe the mountains aren't tall enough, so the plants will disappear. 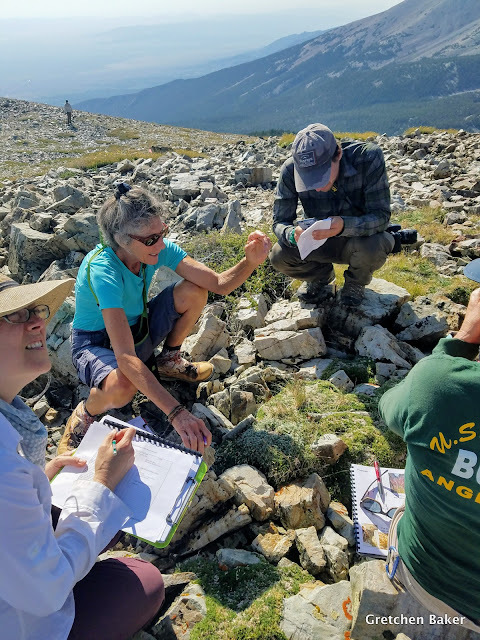 Identifying plants is key, and here master botanist Jan Nachlinger helps get everyone on the same page. The methodology is repeated every five years, so 2018 was Great Basin's second resurvey. 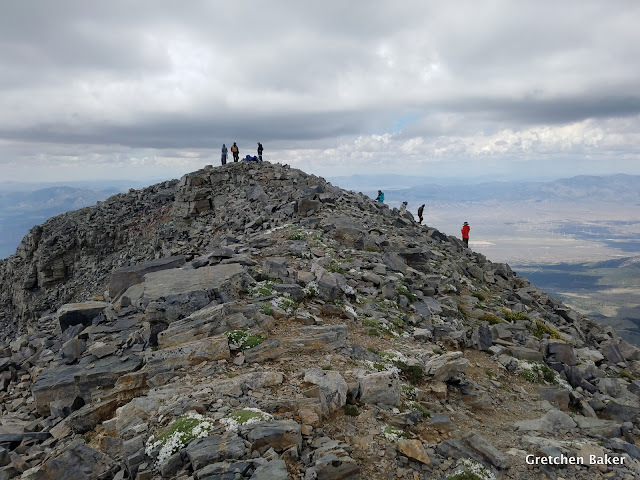 Four peaks are studied: Bald (pictured below), Buck, Wheeler (in the background below), and Pyramid. 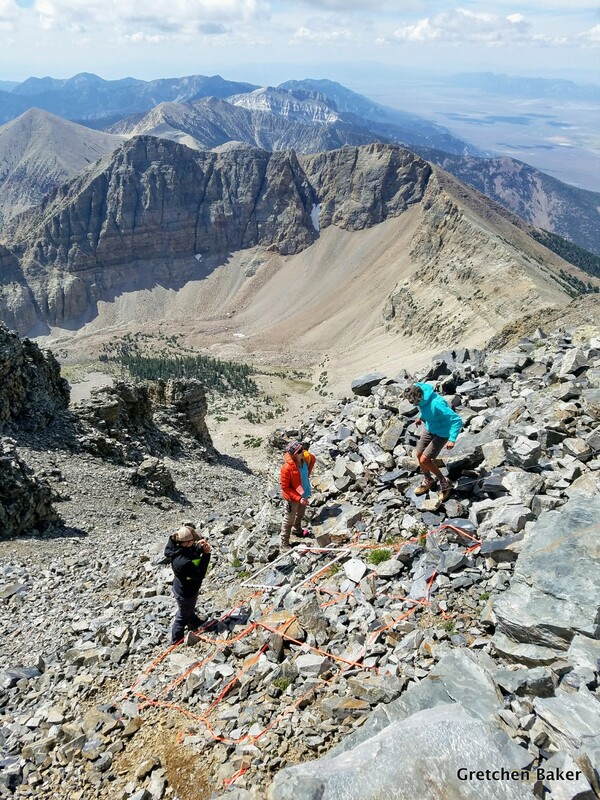 It takes about a day to survey each peak. 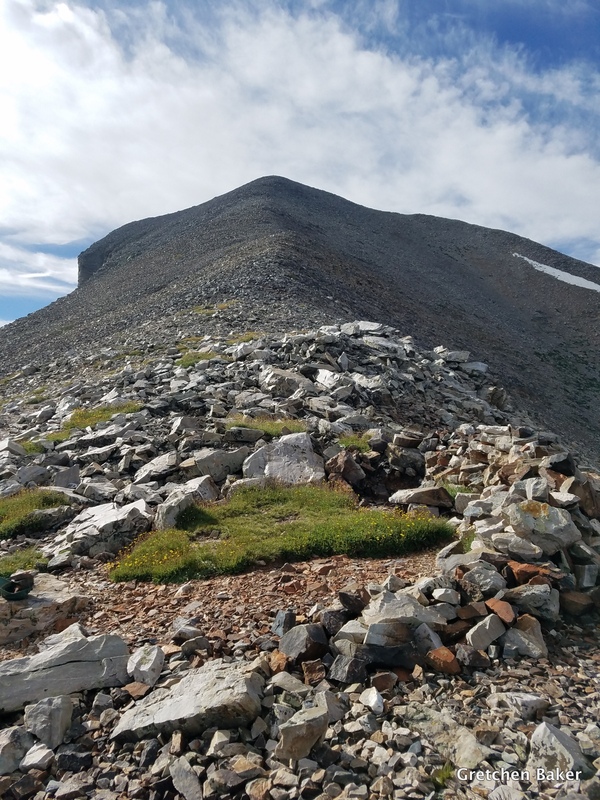 Wheeler Peak involved a 4.1-mile hike gaining 3,000 feet elevation. We passed some plants we had seen on the lower elevation Buck and Bald mountains. 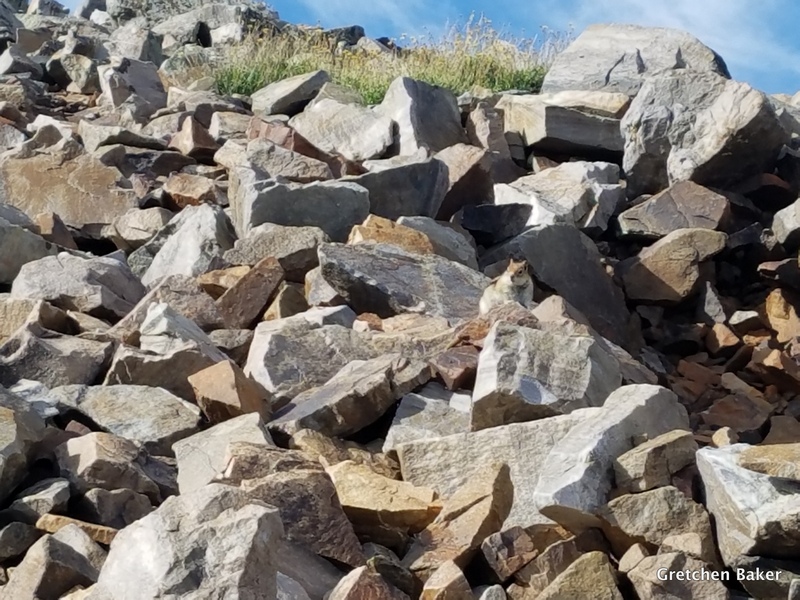 A golden-mantled ground squirrel was hanging out on some rocks while I passed. One of my favorite alpine plants--moss campion (Silene acaulis). Timing the surveys so that the majority of the plants are in bloom is one challenge. We held this survey in mid-July, which was good, because due to the very dry June, some plants were fading fast. It's a long way up Wheeler Peak! On this particular day, we had a lot of wind on this ridge, but as we proceeded higher, the wind diminished. That's not usual, but we welcomed it. There are numerous wind breaks along the way for those who need shelter. Once we were on the top, it was time to set up the plots on each side of the peak. There are multiple protocols to both identify and quantify plant species present. In addition, data loggers are buried on each side of the peak and record temperature every two hours so that a five-year record can be captured and analyzed. One of our challenges (besides long hikes and elevation sickness) was afternoon monsoons. Here the clouds are forming and getting lower. Our time on the peak was limited. I really liked this cushion phlox (Phlox pulvinata). 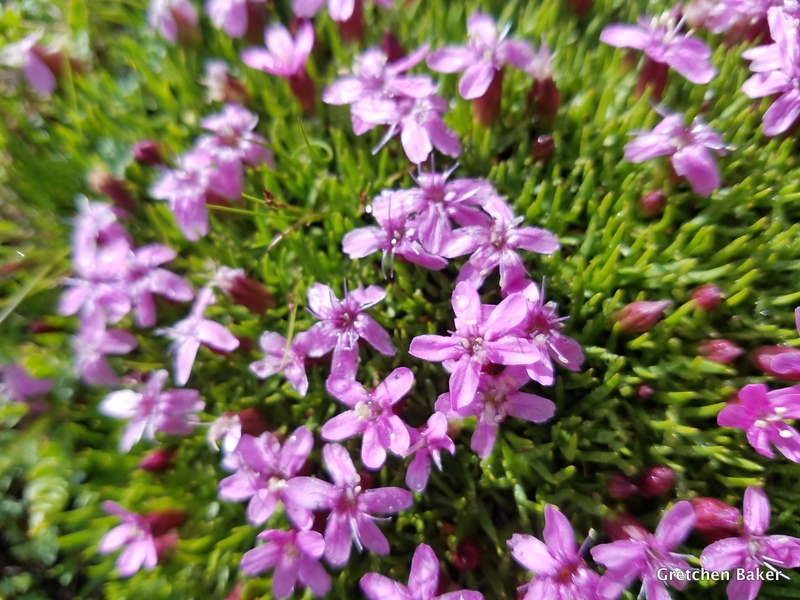 It grows in clumps, and this ring of flowers looks a little like a tiara. Oh no, the clouds are erupting. We heard thunder and started down off the peak. 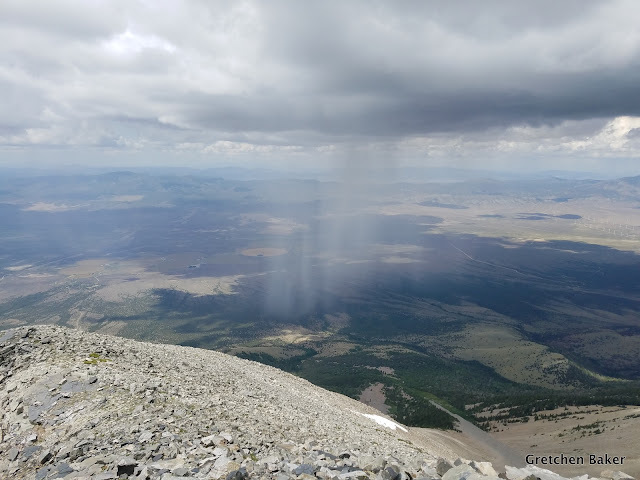 It was weird seeing the rain come out of clouds below us. Fortunately it passed north of us. We kept heading down, and the sun came out, lighting up the Parry's primrose (Primula parryi). 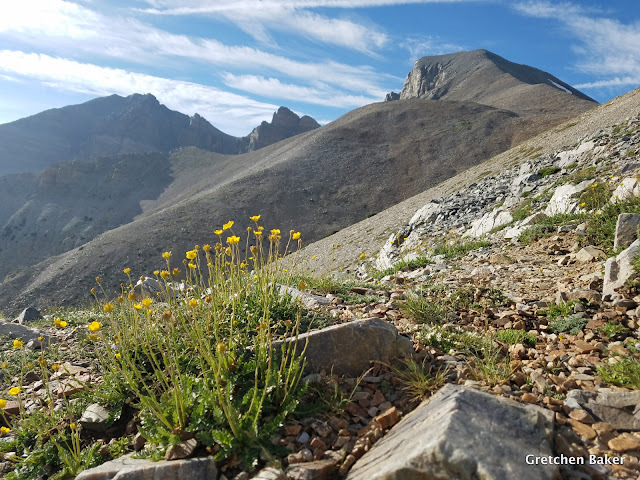 This is usually a riparian plant, but it seems to like the upper slopes of Wheeler Peak too. 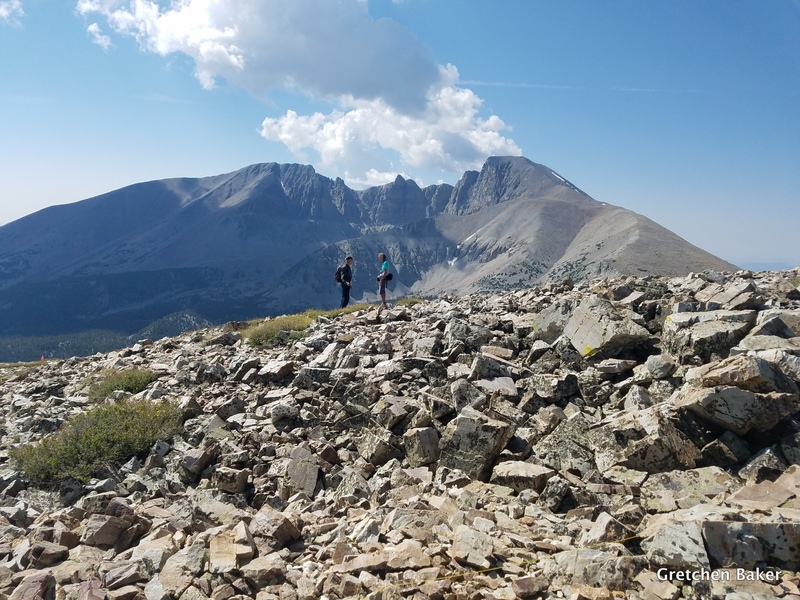 With three peaks done, we only had one left: Pyramid Peak. Pyramid is in the middle of the park, and there's no short way to get up it. 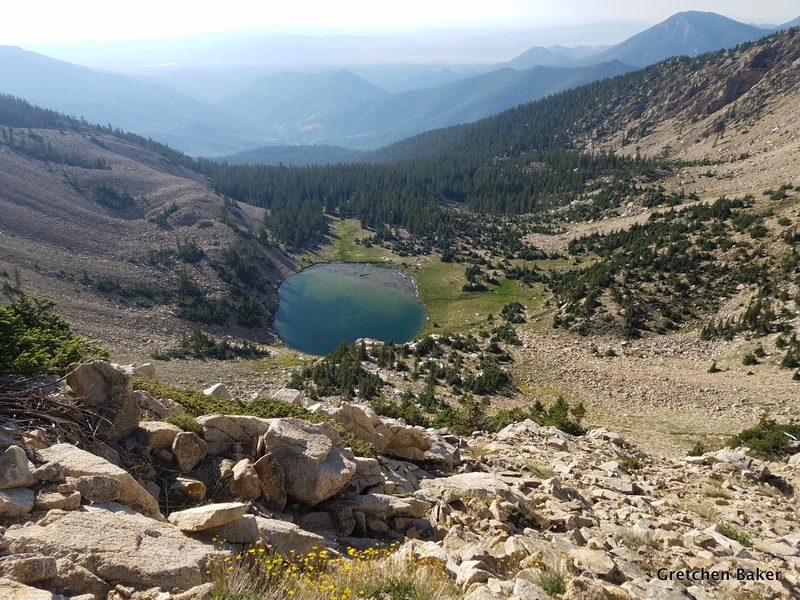 We chose to move our camp over to Snake Creek and start early the next morning to hike up past Johnson Lake to get to the peak. It is such a beautiful hike that the miles flew by. 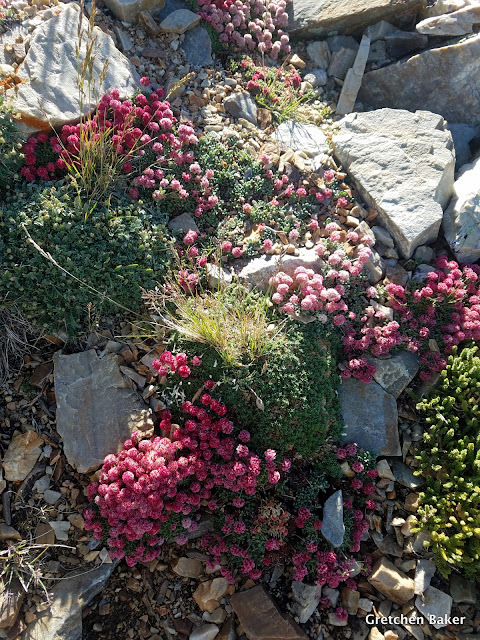 And on the slopes of Pyramid, we saw beautiful alpine gardens. 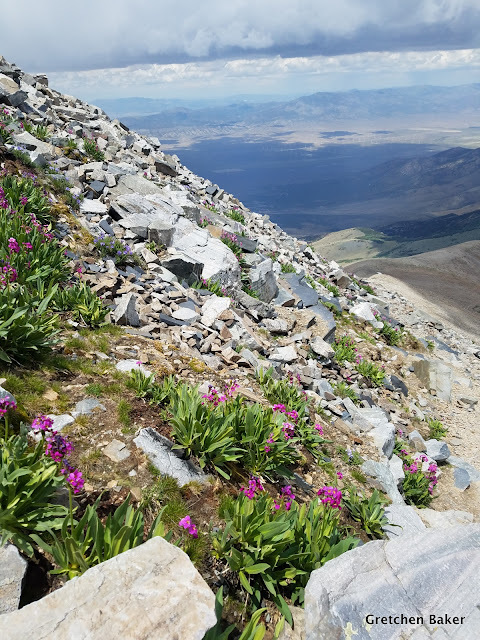 The pink and red flowers in the photo below are Holmgren's buckwheat (Eriogonum holmgrenii), an endemic plant to this range. Fortunately it's not hard to find on Pyramid Peak and Mt. Washington. 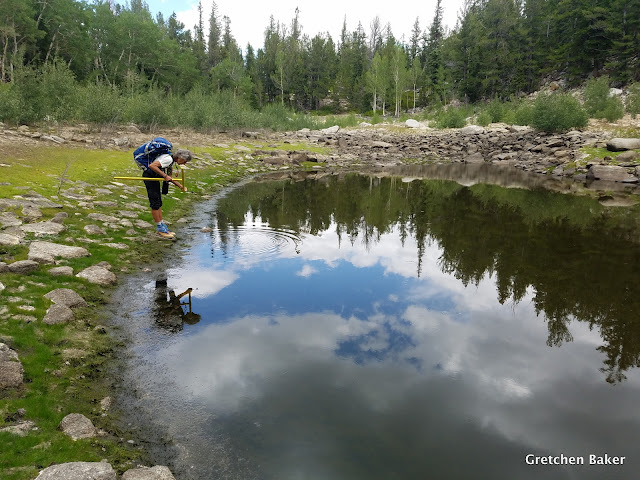 The clouds came in again, and we eventually made a retreat down to Johnson Lake. Fortunately the only part we didn't finish was counting rocks in the 3x3m grids. Seriously, there was no vegetation in any of them. It will be interesting to see if in 10 or 20 years there is some! 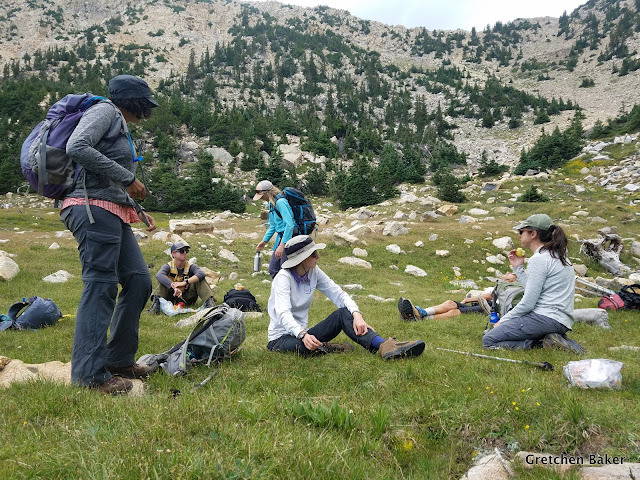 What do botanists do while regrouping? Look for plants of course! And we saw some tiny Botrychium species that I would never have spotted on my own. 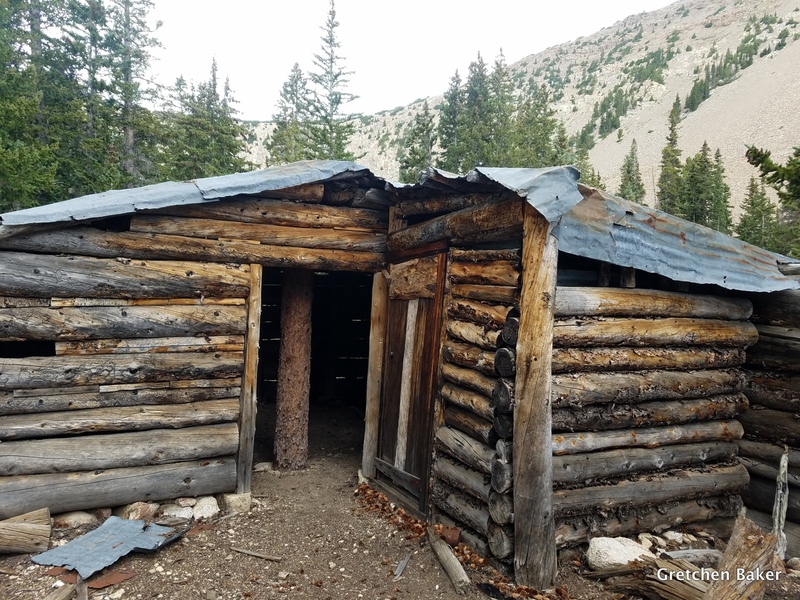 On the way down, a few of us took a look at the restored cook cabin. The restoration work had been done very nicely. 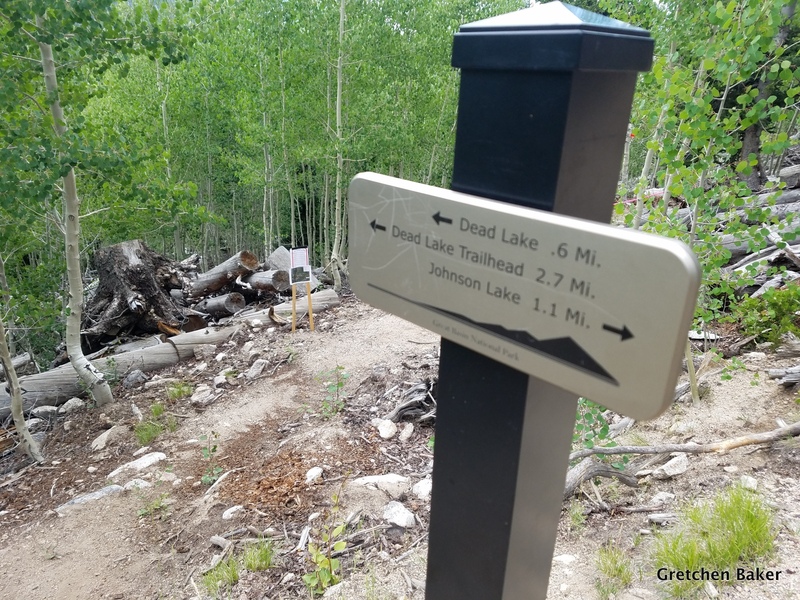 At this new trail junction, we took the trail to Dead Lake, just completed in 2017. Dead Lake isn't much of a lake, but it had some fun plants. And in the fall, the yellow aspen surrounding the lake make for some great reflections. And with Pyramid Peak done, the GLORIA season was over. We were happy to have successfully completed the surveys. We found a few new plants in our plots, perhaps because of climate change and perhaps because they didn't flower in the other years. We feel like we have a good baseline now with three surveys completed, and over the next decades will be looking for trends. This is definitely not a project where you get quick answers! 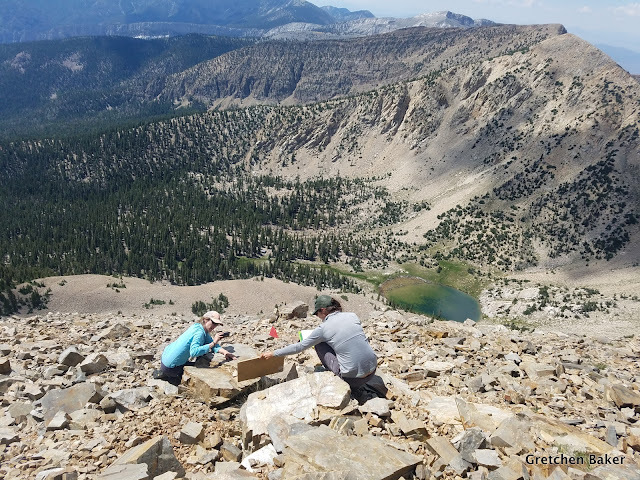 If you'd like to learn more about the GLORIA Great Basin project, check out their friendly website. And here you can see the global distribution of the GLORIA network. Maybe someday I can participate in a GLORIA survey on a different mountain range, and maybe even a different country! No matter how old I get, I'm still learning something new, now and then.